Cut and Paste - Copying part of one image to another. "Copying part of one image to another." 1 - Open all the images in your image editing software. I use Photoshop but the principle is the same in most software. 2 - Select the section you want from the photo of the student as explained in - www.better-photographs.com/image-extraction.html. Steps 8 to 10 cover the part that you want to perform. There are other methods of extracting but without seeing your images, I cannot advise. The magnetic lasso is a good all rounder. If your software has an option to "feather" the selection then I suggest you set this to 2 or 3 pixels. 3 - By holding the 'Ctrl' key and the left mouse button, drag the image section of the student across to the photo of the gothic house and release the mouse button. This will create a new layer which you can move and resize as appropriate. 4 - Repeat this for all the students. This will give you the background and a separate layer for each student in your final composite image which you can edit individually by selecting the appropriate layer. 5 - When all is done, flatten the image for saving/printing/displaying. Don't hesitate to email me if you get stuck. 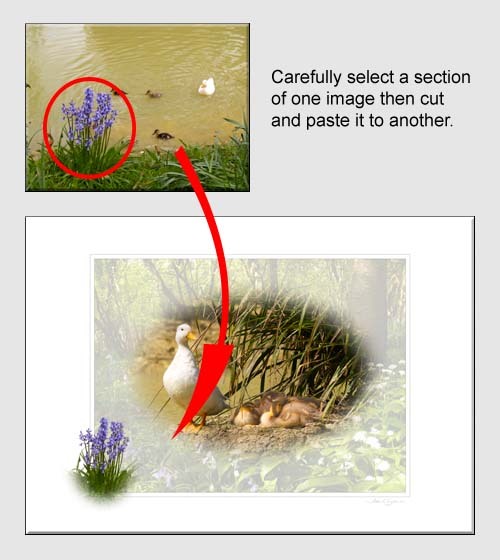 Return from Cut and Paste to the Photography Tips page.